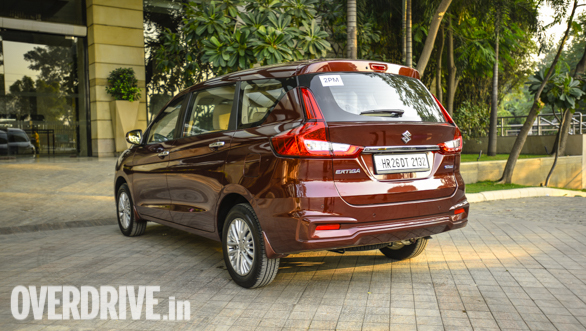 The all-new Maruti Suzuki Ertiga has a lot riding on its shoulders. It's predecessor was an instant hit in the market, as soon as it was launched in 2012 and to date the company has sold over 4.2 lakh Ertigas in India. That's a staggering number considering it's the only other MPV that clocked consistently good sales figures other than the mighty Toyota Innova. 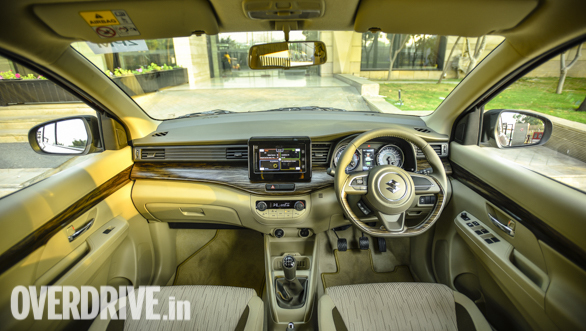 We drove the car in the Delhi-NCR region and were pretty impressed with what the new Ertiga brings to the table. That said, we did find a few niggles in our short drive and so we've listed out what we like and dislike about the new Ertiga. The first word that comes to the mind when you look at the new Ertiga is upmarket. While the previous Ertiga evoked mixed reactions when it came to looks, the new Ertiga was unanimously voted as a stylish MPV. There are a number of factors that make it look appealing, such as the chrome studded grille, projector headlamps, floating roof effect and the Volvo XC60 inspired LED tail lights. The interior is a major step up compared to the previous car. The dual tone dashboard is uncluttered and the simple layout looks very neat. The thick slab of faux wood running across it feels premium to the touch while the floating style positioning of the touchscreen infotainment system adds to the feeling of being seated in a premium car. The front seats are very well contoured and offer good under-thigh support. The Ertiga's new Heartect platform liberates more interior space than the predecessor and that's evident in the improved knee room in the second and third row of seats that can be reclined as well. That said, the headroom in the third row is tight for people over 5ft 10inches. The beige colour of the upholstery and door panels as well as the large glass area contribute to an airy feeling inside the cabin. 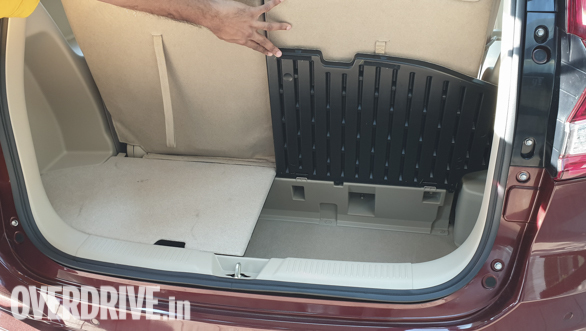 One of the peeves with the old Ertiga was the lack of bootspace with the third row of seats in place. There was barely any room to store a couple of handbags. 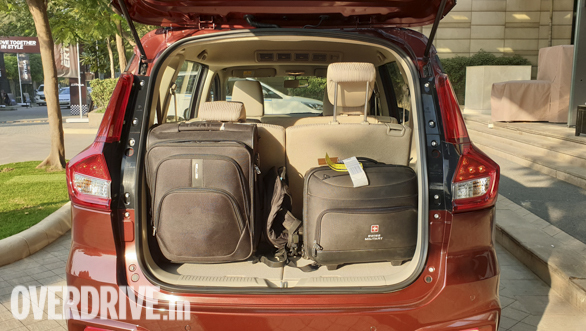 The new Ertiga, however has plenty of space, 209 litres actually, to store two small/ medium suitcases. There's a large stowage bin under the boot tray as well, maximising storage capacity, in fact, there are a thoughtful storage spaces across the cabin. All passengers get bottle holders, and the deep slit that acts as a door handle is ideal for storing phones or small wallets. 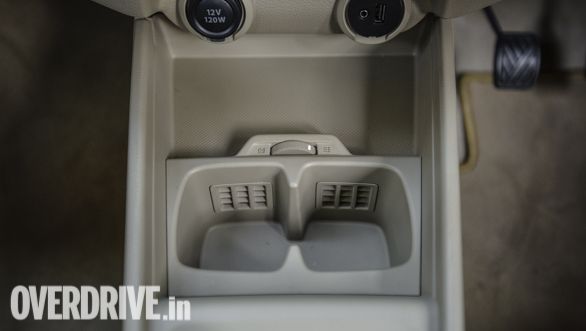 And then there's the chilled twin cup holders in the centre console that's another indication of the attention that's been lavished in designing the cabin. 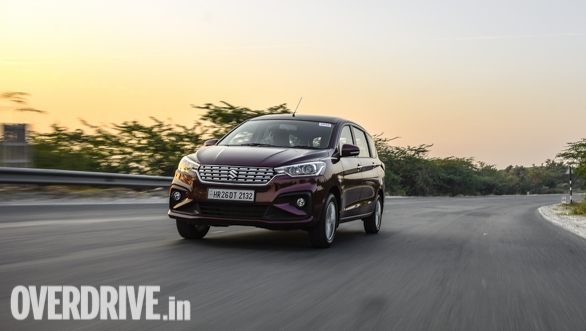 While the tried and tested 1.3-litre diesel engine with SHVS is carried over, it's the new 1.5-litre petrol motor that's the talking point. It is smooth and coupled to the mild hybrid system quite tractable as well. The battery powers a small motor that powers the front wheels, acting as torque fill before the engine revs rise to the meat of the engine's powerband. It worked quite well during our first drive but we'll reserve comments on fuel economy after the road test. 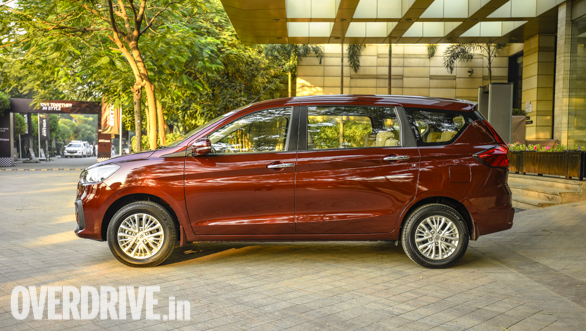 The 15-inch alloy wheels have caused a large gap between the wheels and the wheel arches which give the Ertiga an undertyred look. 16 or 17-inch wheels would have been ideal. At highways speeds in excess of 80kmph, there's a lot of road and wind noise that creeps into the cabin. Since the Ertiga is a car that people would cover long distances in, the NVH is a an area that should have received more attention or in this case, compromises. 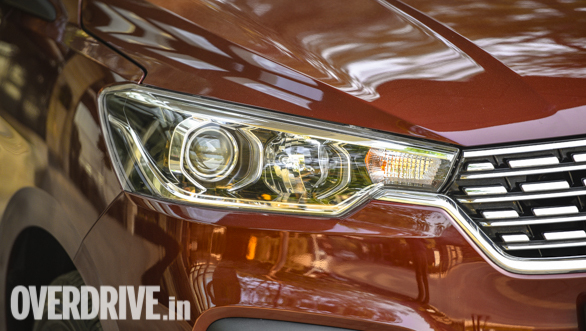 Projector lamps without LEDs are pointless and we can't understand why Maruti decided to skimp on this feature when the top spec Swift gets it.